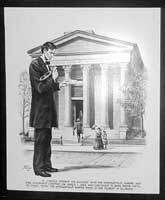 Description: Abraham Lincoln opened his account with the Springfield Marine and Fire Insurance Company on March 1, 1853, and continued to bank there until he died. Today, the Springfield Marine Bank is the oldest in Illinois. Copyright © 2009 Interactive Data Technologies.